As Republican candidates battle to keep their congressional majorities in the midterm elections Tuesday, Trump is crisscrossing the country to deliver a closing argument meant to acknowledge — and in many cases stoke — women’s anxieties. COLUMBIA, Mo. — Standing in an airplane hangar in the mid-autumn chill awaiting the arrival of President Donald Trump, Joan Philpott said she was angry and scared. Only Trump, she said, can solve the problems she worries most about. “He wants to protect this country, and he wants to keep it safe, and he wants to keep it free of invaders and the caravan and everything else that’s going on,” said Philpott, 69, a retired respiratory therapist. Philpott was one of thousands of women who braved a drizzle for hours to have the chance to cheer Trump at a rally here Thursday. While political strategists and public opinion experts agree that Trump’s greatest electoral weakness is among female voters, here in Columbia and places like it, the president enjoys a herolike status among women who say he is fighting to preserve a way of life threatened by an increasingly liberal Democratic Party. As Republican candidates battle to keep their congressional majorities in the midterm elections Tuesday, Trump is crisscrossing the country to deliver a closing argument meant to acknowledge — and in many cases stoke — women’s anxieties. At rally after rally, he has said that women “want security,” warning of encroaching immigrants, rising crime and a looming economic downturn if Democrats gain power. Some of Trump’s female backers initially supported him only reluctantly or do so now despite reservations about his bawdy language and erratic behavior. But they shared in his victory after the bitter and partisan battle over the confirmation of Justice Brett Kavanaugh. And many believe the president when he reminds them during each of his hourlong pep rallies that the world they know — largely Christian, conservative and white — is at stake Tuesday. But that warmth toward the president is decidedly a minority view among women around the country, and Republican officials fret privately that Trump’s harder-edged messages will alienate the women the party needs to preserve vital seats. Women disproportionately opposed Trump’s election two years ago and have turned against him in even greater numbers since, an ominous sign for members of his party. Anna Greenberg, a managing partner of the Democratic polling firm Greenberg Quinlan Rosner, said Trump’s dark view of immigration, articulated in a racist video posted to his Twitter account and several fiery speeches, was likely to repel suburban and educated women. “I don’t see any reason to believe we aren’t going to have an enormous gender gap, particularly driven by suburban women,” Greenberg said in an interview. Yet days before the midterm elections, women are streaming into the president’s campaign events wearing bedazzled hats and T-shirts proclaiming Trump’s greatness. 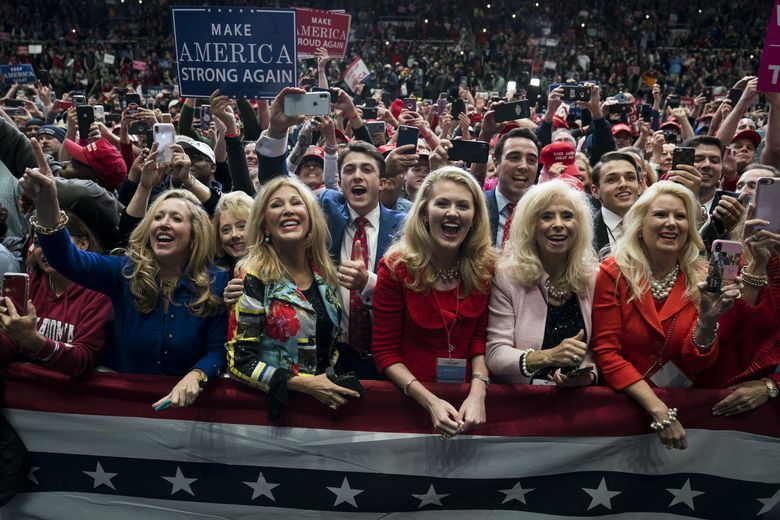 In between the selections from the musical “Cats,” the Celine Dion ballads and the Elton John classics that fill out the president’s campaign soundtrack, they hoist hot-pink “Women for Trump” signs as they balance babies on their hips. And they scoff at the suggestion that Trump — who has been accused of sexual assault and boasted graphically that he could do “anything” with women — has a problem with them. Like Philpott, many of the women expressed a vague anxiety about an economic downturn if Republicans lose. But it is their visceral fear of immigrants and raw anger about changes in cultural mores — encapsulated by what they called Democrats’ rush to believe uncorroborated allegations of sexual assault by Kavanaugh — that appear to be driving the intensity of their support for the president. Bass, who attended Trump’s rally Friday afternoon in Huntington, West Virginia, said she believed the president’s claims that the migrant caravan heading toward the United States from Central America was being funded by American liberals — probably, she said, by George Soros, the Jewish billionaire who has been the target of conspiracy theorists for weeks. The president did not, in fact, do great with women. While he often claims that 52 percent of women supported him, that was the proportion of white women who did so; overall, 41 percent of women backed him in the presidential election. Since 2016, women have grown only more skeptical of him. A recent NBC/Wall Street Journal poll found that 38 percent of women approved of the job he was doing, substantially below the 47 percent it recorded overall, and 58 percent of women disapproved. That is certainly the case for Kristin Sellers, 48, of Pace, Florida, who said she was “anxious as hell” about the migrants, and trusted Trump to keep them out. “It doesn’t mean I agree with everything that comes out of his mouth, because like his wife, I’d like to take his phone from him, but I just felt that we needed someone with a business sense to get our country back on track, and that’s what Trump has done,” Sellers said as she waited for Trump in an airplane hangar in Pensacola, Florida, on Saturday. Some of the women who are backing him were not sure two years ago that they wanted him to be president. Spencer-Sauer said she “struggled” briefly to decide whether to support Hillary Clinton, reflecting on the history-making milestone her election would set. But when Trump won the Republican primary, her doubts were erased. Meifang Wang, 54, a cardiovascular researcher at the University of Missouri, also sparred with her children about her support for Trump, an argument that they won in 2016, when they persuaded her on Election Day to stay home rather than vote for him. Wang, who immigrated from China in 1990 and voted for President Barack Obama twice, said Trump’s harsh tone and policies toward immigrants did not bother her. Wang was one of many women interviewed over the past week who spoke of Trump as a paternal, benevolent figure. They smiled and shook their heads as if dismissing the antics of a beloved uncle when asked about Trump’s callous remarks and erratic behavior. Rachell Marks, 59, who works in car sales in Billings, Montana, said she would continue to support Trump because she believed he told the truth.